Get your sweat on and get certified! 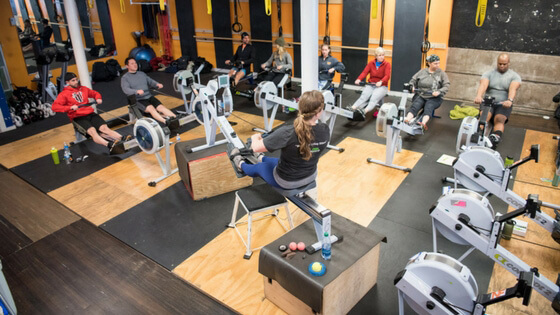 Give us a day at our indoor rowing certification and we’ll give you all the fundamentals of teaching indoor rowing on the Concept2 rowing machine. Certified indoor rowing instructors are more credible and are in high demand. Why? Because they have what it takes to help their students get their best results. Here’s the list of upcoming indoor rowing certification trainings. Don’t see the location you want? Let us know in the comments or by email to info@ucanrow2.com. We’re always up for adding more dates and locations. There’s a lot of bad rowing to be fixed out there! 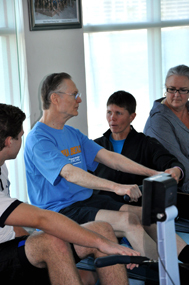 Need more information on indoor rowing certification? Visit our Instructors page and our FAQ. If you’re a home or gym user of the Concept2 rowing machine, we’ve got something new coming just for you: A half-day training that will get you tuned up and ready for new (or renewed) action on the world’s #1 indoor rower! The workshop is part of our Flywheel Frenzy event at Owens Community College in Toledo, OH on April 12-13. – Taking you on a tour of the Concept 2 website’s resources. – Bonus: Meet the SkiErg! Registration for the course is $95. Just note your course and fee on the registration form. Want more? Join us the night before for a master class with Concept2 Master Instructor Terry Smythe from 6:30-8:30. You’ll spend two hours in OCC’s fitness playground, combining the rower, SkiErg and indoor cycling with other equipment like TRX and free weights. Register now: $45 ($15 for students) Note your course and fee on the registration form. And for those who are teaching others or working with clients on the rowing machine, we’re offering our Programming Intensive on Friday afternoon from 2-5 pm. We’ll show you how to set yourself apart from the competition by mixing up your workouts with on/off erg work. Combine ergs, TRX straps, free weights and more to create a fat-blasting workout your members will rave about. Have your rowing technique checked by an expert. Learn how to use social media to get people into your classes – and keep them there. Questions? Post them to the comments.